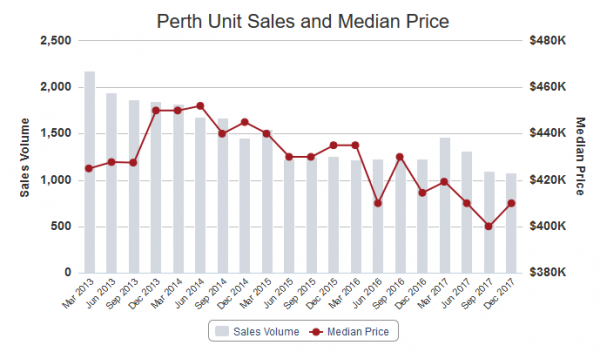 Home » Perth Property Market Updates » April Perth Property Market Update – Median House Price Bounces Back! Gday! I’m Jarrad Mahon from Investors Edge Real Estate. Thanks for joining me for my Perth Property Market update for April. I’ll cover off my insights into the Sale Market, the Rental Market, all the happenings that are going on as well as the Property Clock and how we relate to the other states of Australia. So launching straight into it, you can see that the number of properties for sale on trend has been down since about January 2016 which is a great sign that our market is gradually recovering. What started happening in the last few months however, is as those market conditions are improving, there’s more and more sellers that have wanted to offload properties that have started to come on and increase that number. So you can see that we’re actually up by 4.4% for the total number of properties that we’ve got for sale compared to October last year. And we’re still down on a year ago with an untold number of owners of properties still wanting to sell. So what we’ve really got to look for is, is the demand in buyers gonna keep the overall trend in the number for sale heading down or not. So when we go over and look at that trend in the buyer demand, we can see that the number of sold has kind of been going down sideways, well it has been going sideways so never had any major uptick in the buy or demand yet. Where’s that buyer demand gonna come from? It could come from the eastern state investors, it could come from interstate and overseas migration. And we’ve really got to look to see if the ever increasing economic factors are going to drive those two things or not. So those numbers are continuing to improve with the economy and we will hopefully start to see this pick up. But in the last one to two months and especially this month we’ve seen a pretty low level of demand which is surprising. Since October it’s 15% percent down on the demand, in the week to week number sold and it’s around 14% down on the same time last year. So we really don’t want that trend to continue. It’s still within it’s overall trend line but we really need that to pick back up and continue to have properties turning over and selling quicker if we don’t want the overall supply to start to increase outside of its downward trend. 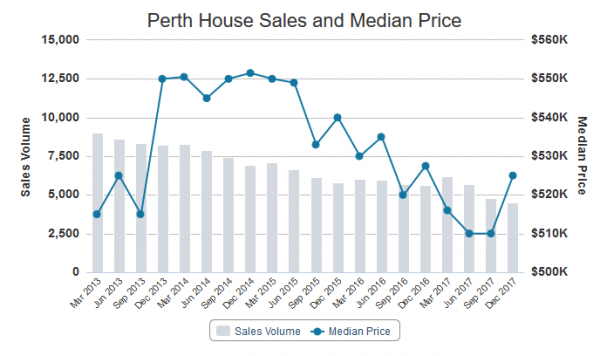 When we actually look at the Perth house median price, we’ve got some exciting news there for current property owners. For the very first time since June 2015, since then we have had a downward trend in the overall price and we’ve broken out above that trend now with a median price of $525,000. We need to see that price increase if the trend is going to continue but it’s the first time that I can report to you that we’ve actually broken out of that trend for price. Now price is always the last of the different factors that show up, so the supplies have been ever decreasing, demands been about the same and now we’ve got to that stage where we’re starting to see some price pressure back on. So that’s a good sign for our overall market that we’ve officially turned the bottom and we’re starting to recover when we talk about the averages across Perth. When we actually look at the unit market, we’ve also had a minor uptick there as well to $415,000 so keep an eye on that. Now it hasn’t been as stronger breakout (as houses) but it’s certainly been a bit of a breakout on the downward trend. So I’m gonna keep a very close eye on that unit pricing as well because the unit market is generally trailing the sale market by about 12 to 18 months. So expect this to drift around this price without any strong uptake but if it starts to surprise us that would be a very positive sign for units. Now going into the Rental Market, we can see a very strong trend developing in the number for rent decreasing 18% down in the total number which is massive since October of last year. And 19.2% down on the year before, so you can actually see the majority of that decrease has come in the six months since October. And really starting to heavily decrease in the last three to four months. So as the market starts to tighten up, we see the vacancy rate drop as well. So, look at how straight that drop is, we’re down to 5.1% vacancy rate and that’s a 26% drop since October, 21% since the previous time last year. That’s very encouraging that our rental market is starting to tighten up and we’re actually finding a little bit easier to lease properties now, thank God. It was very tough last year and we’re starting to find rental prices increasing in the many of the middle price suburbs, the further out, lower end suburbs, there’s not as much demand there. Taking a bit longer to rent there so it’s going to take a little bit more time for those outer areas to recover yet. When we look at the median rent, the rental price is unchanged since May of last year at $350 per week after decreasing for all so long since November of 2013. So waiting to see this rental price have its first rise which hasn’t happened yet so we’re not fully in recovery mode for the rental prices. But you have to think that as this vacancy rate continues to drop, usually when we get to in the 3% that’s where we will start to see pressure again on the rental price and see that start coming back up. Obviously that varies depending on which suburb your property is in and we can give you specific advice depending. 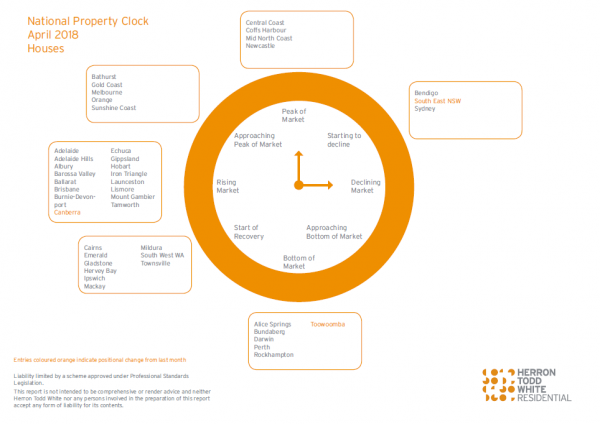 So Timing the Property Clock and where does Perth sit, was are still in the bottom of the market phase. As you can see here along with Alice Springs and Rockhampton and Darwin we tracked them together and the other capital cities farther around. Brisbane’s in it’s rising market, Sydney coming off the boil and it’s starting to decline and Newcastle, peak of market, Melbourne’s approaching its peak. So, I suspect what’s going to happen on a national level, is as Sydney and Melbourne are coming off their markets, it’s gonna be a bit of pain to be felt over there and a lot of the Reserve Bank’s policy is very heavily influenced by the East Coast. So hopefully that will see our interest rates kept unchanged for some time and even if they started increasing interest rates on top of the coming off of the market over there, they’d be even more pain to be felt. So I think because were over in Perth, pretty much isolated from the rest of the country. They’ll be doing what is best for the rest of the East Coast not necessarily what’s best for us. So the holding rate will serve us and help us to recover too. 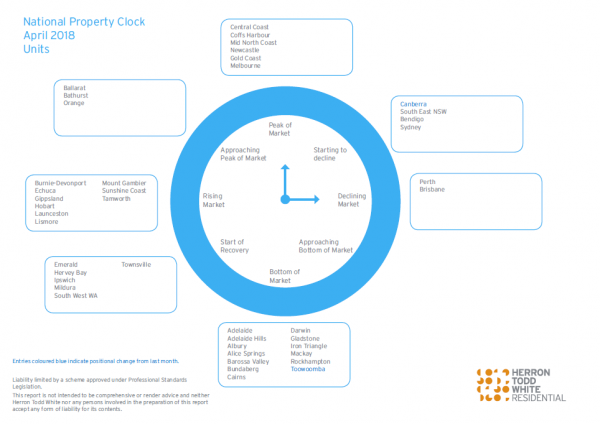 The Units Clock, you can see that Perth’s still round here in this declining market, that’s why I say that generally it’s another 12 to 18 months off (from bottom) and that’s because of a number of factors. There was a lot of over supply and a lot of areas of apartments with that change in the R-codes close to 18 to 24 months ago and that’s still taking some time to be washed through. And really you should only be looking at units if there’s something unique about them or they are in small strata groups. And you need to look at the different unit types differently. You can’t just chuck all units in a one bucket. A unit as far as all the stats are concerned is anything that’s an apartment, a townhouse, a villa and a traditional unit. I will be more focusing on those that have a higher land component like the villas and the townhouses and you will find that they will really remain popular over the next two to five years. And with the majority of the developers now building apartments, they’ll actually start to become a lot more unique and sort out. If you can’t afford a house at the in the middle ring areas, look to the villas and townhouses to get into those suburbs where the amenities are better but there’s likely to be more growth over the shorter term. Now of course if you want specific advice on where to buy, we’ve been hearing from a lot of investors over on the East Coast these last couple of months. Also been getting heaps of people along to our Perth Property Investor Meets Ups. I’m looking forward to hopefully see you at one of our next ones make sure you check it out. We have a range of topics so far from investors stories, development and this month we’ve got one on depreciation and using that to maximize your overall returns on property. So hopefully I’ll see you along otherwise let me know if you need any specific property advice.